I have many more pics so just let me know what area you need and I probably have it, with the exception of the pit, which you seem to have under control. Thanks Pete for the airbrake pics. 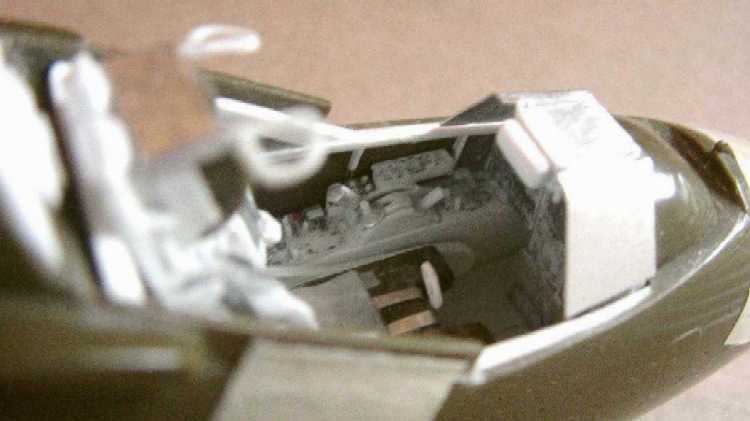 They inspired me to take a little diversion from the pit and modify the kit's airbrake box (it was just a box with no detail) and the airbrake door. I tried embossing a piece of aluminum on the reverse side to make the adjusted interior door surface. The contours worked out fine, but the raised rivets didn't. The aluminum I used was a bit too thick (approx. 0.009") which converted a rivet tool point into a gumdrop sized raised rivet on the reverse side. I'll need to adjust that! The hydraulic actuator is made of two aluminum tubes with the final rod of thinwall polished stainless steel hypo tube (once all is painted it will show up better). 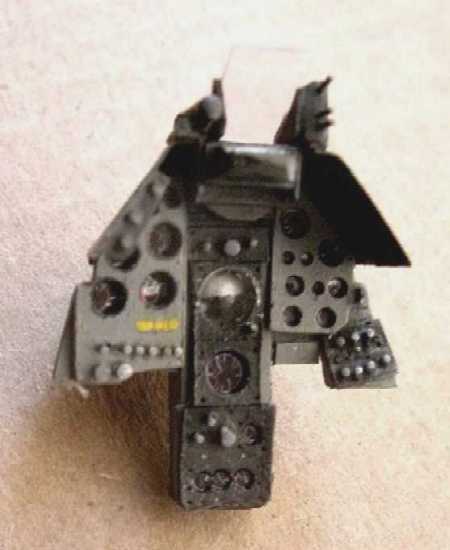 Since you offered Pete, do you have anything on the Harrier I showing it mounted with Sidewinders? Most excellent work Gene! I really like you attention to detail! Great work, Gene!! Those airbrake wells look fantastic!! Great work on that airbrake. The pics I have are of a local bird at a museum nearby. They don't have any Sidewinders mounted. I have pics of the pylon, will they help? MMagnificent work there. This is one plane we don;t see built too often. Great choice. It could be made to look really mean and businesslike. Thanks Alan, Ray, Pete and Brian for the encouragement. And thanks Pete for posting the ref pics - that has the 'well-served' look that I hope to tackle. Work continues on the interior to indicate various knobs and dials on the side consoles and instrument panel. One reference has been especially useful in this effort (in fact I doubt I would have attempted detailing the cockpit without it); it is the Aerophile Extra Number 1 (1982) by James Wogstad & Jay Miller devoted to the AV-8 Harrier and its early variants. Within this fine volume is a flat layout of the instrument panel and the side consoles. 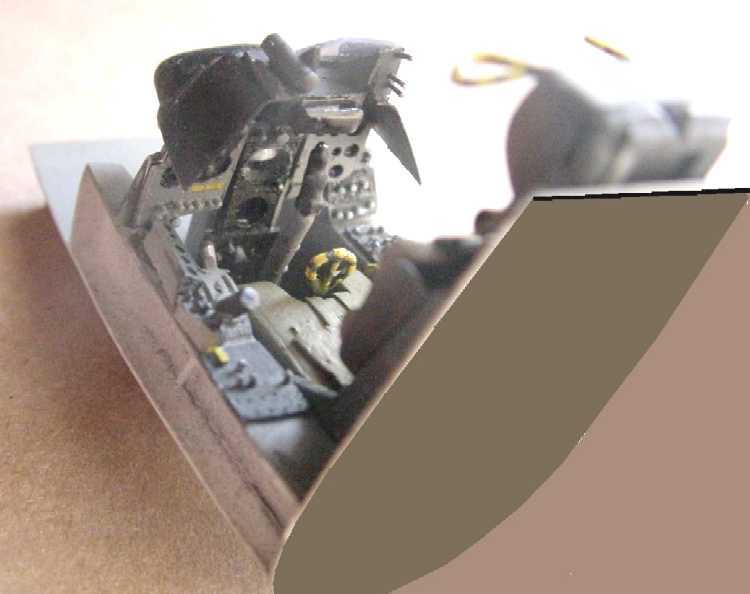 The layout is without scale bar, so I've taken considerable liberty in adjusting things to fit the Revell kit cockpit space (even with a scale bar, compromise would still be necessary). With a digital camera, I took pics of the layouts and reduced them to fit the spaces. 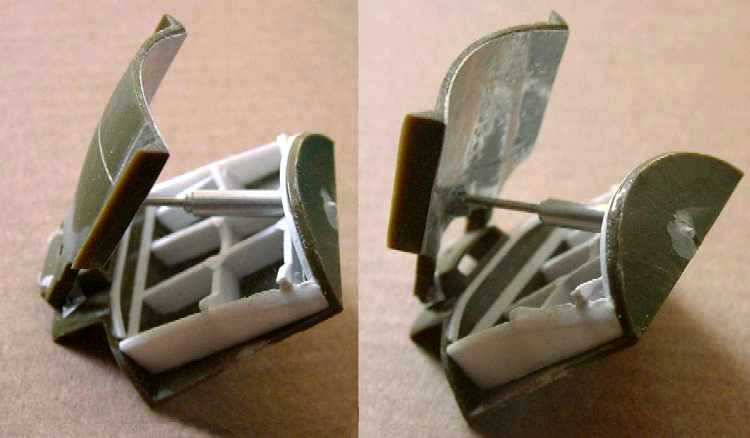 Then they were glued to 10 thou plastic card, punched for instrument holes or drilled for stubs of styrene rod to represent knobs and switches. Just rounded out the nozzle control quadrant, so I'll post that before I go on. Next finish up the instrument hood and HUD. Some cockpit paint sure helps tie all the elements together. For the instruments, I coated the surface of some thick aluminum foil with a black marker ink (very similar to laundry marker ink). That was laid under the styrene panel with punched out dials and the dial edges were scratched into the surface of the aluminum. Removing the aluminum, I was now free to scratch in the dial scales and numerals - not - but some marks were scratched in to resemble the dial graphics. Basic interior paint was Model Masters 1741 Dark Ghost Grey (FS 36320) enamel, which seemed to resemble the few cockpit photos I've seen. A light aging was accomplished with some pastels. On to the next item! Am I enjoying this build man. i havent; seen many of these built. You are doing a fantastic job. Thanks Brian for your kind words - you have given so much pleasure to me in your LSP postings it has inspired me to try harder. Happy to hear your are enjoying the build thus far! In the search for 'what is this and that supposed to look like' some uncomfortable discoveries were made. 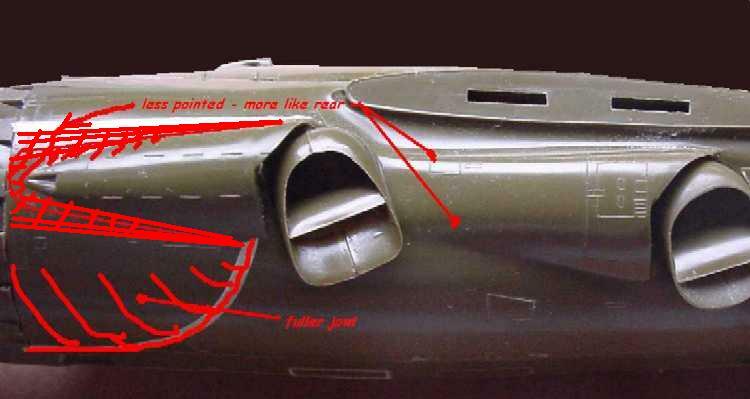 It seems the actual AV-8A (and GR.1) have the intake jowls enlarged or modified by expanding the lower surfaces (perhaps this has to do with an uprated engine). The Revell kit looks to have taken its inspiration from the early US test examples designated XV-6A (a.k.a. Kestrel), but the Revell kit is hit and miss on several points resulting in not being totally one or the other. Most kits in other scales depict this intake jowl area more correctly. 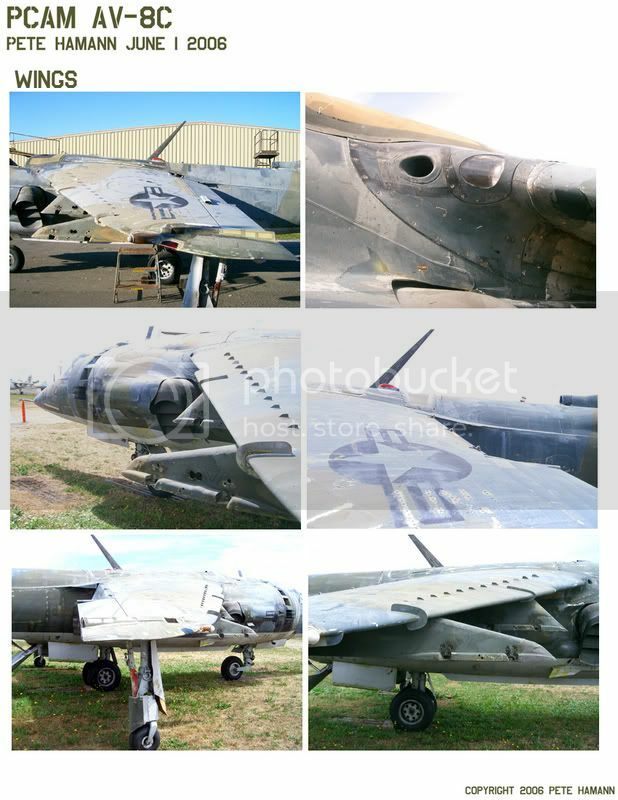 Also, the forward nozzle fairing seems to be much less pointed in later Harrier I versions, especially in the case of the AV-8A; so much so that in the photo ref it is difficult to see just where the fairing starts. So before closing the cockpit, I've decided to scratchbuild a little surface adjustments in this area (it's a messy job and a prime chance to mess up some prior work! ).